Currently, there are 118,000+ men, women, and children on the transplant waiting list. While 95% of adults support organ donation, only 56% of them are registered donors. With the stark difference in support and registered donors, I sought to understand the causes of this difference and discover the most effective approach to narrowing this gap. According to a study done by Brian Quick, a professor at the University of Illinois, “there are a lot of people who subscribe to the belief that if a doctor knows you are a registered donor, they won’t do everything they can to save your life.” Quick also discusses how people who believe that medical professionals will not save them if they are organ donors are often the same people who watch medical drama shows on TV, which depict said medical mistrust. By providing the general public avenues to seek information, the truth concerning specific myths and misconceptions of organ donation can be brought to light and educated decisions can be made about organ donation. While on the web app, users will be able to play a game called “Myth or Fact” where they read a statement and they have to decide whether they believe the statement is a myth or a fact. After choosing, they will see a screen telling them if they are right or wrong and have a small explanation to inform them further. This game will be able to collect data about which myths are less known in order to help educate people continuously. The statistics from the game will be used to create motion graphics which will be displayed on social media. 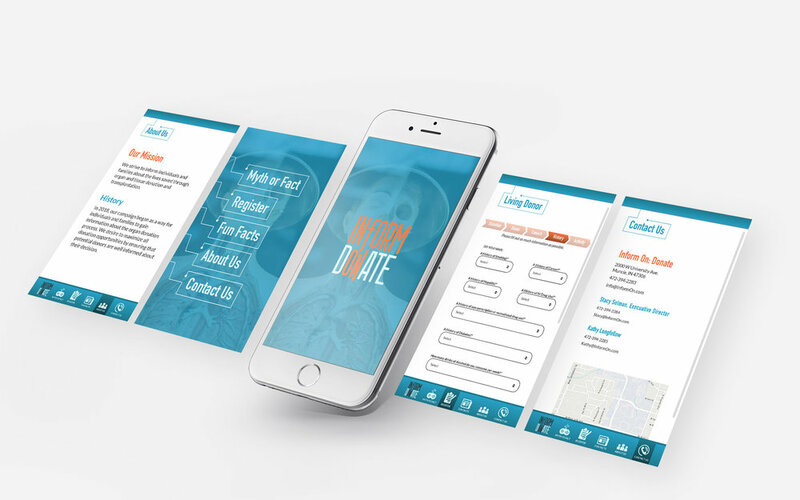 The app will also have similar information as the website, where users can view fun facts and register to become a donor. Through the use of motion graphics, the public will be informed about statistics and other information about organ donation. Aspects from the identity system were used to aid in creating dimension and interesting visuals to go along with the statistics. The graphic will show a conversation between two people about the most popularly believe myth or misconception of a certain time and then reveal the truth behind it in order to educate the people and give them the facts. The myth will be chosen from the data provided from the web app and will change depending upon the specific myth that is the most believable. This website will be a source of information for the general public- a place where they can come to learn more about the organ donation process, the common myths and misconceptions, and how to register to become either a living or deceased donor. Visitors can view life stories from organ donors/recipients and their families, register to become an organ donor, learn fun facts about donation, and various other aspects of the organization. By giving this campaign a name and an identity system, it will make it easily recognizable. The logomark shows how during organ donation one person gives a part of themselves to another, just like the color and wording from “Inform On” blends into “Donate.” The line element seen throughout various pieces of the campaign ranges from a line with a dot on the end to forming a speech bubble. This shows flexibility and allows the identity system to work throughout the individual platforms. Social media is a place the public turns to in order to gain knowledge about particular topics. 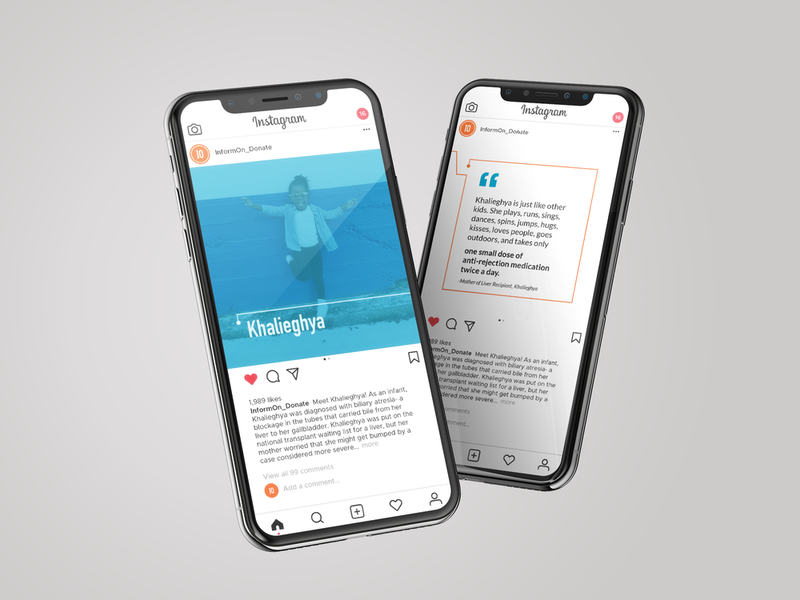 By including social media in the campaign, it develops a place for the public to turn to read about the benefits of donating from first hand stories of recipients and families of donors. It has biweekly motion graphics posted to bring awareness to the most believable myth or misconception which will be determined from the app statistics. The general public is able to use the social media page as a way to communicate and ask questions about the organ donation process.